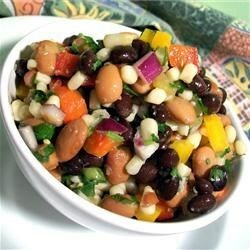 "This is a yummy Texas caviar made with black beans and pinto beans instead of black-eyed peas. Serve with scoop-style tortilla chips as a great party appetizer." Mix the black beans, pinto beans, white corn, green chiles, jalapeno pepper, red and green bell peppers, red onion, and cilantro together in a large bowl. To make the dressing, stir the rice vinegar, olive oil, sugar, and garlic powder together in a pan. Bring to a boil, then remove from heat, and cool. Pour dressing over bean mixture, and toss to mix evenly.